This is CF Contributor Maggie's last post. 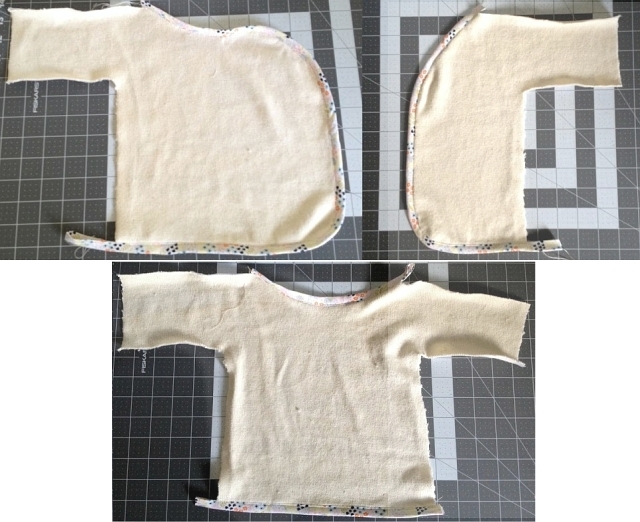 But before taking time off, Maggie modified a baby pattern to cut and sew a tiny sweater knit top for the little one on the way. With Baby G.’s arrival imminent, I have been busy making lots of new things for her, like burp cloths, recovering a rocker with a removable and machine washable cover, and tiny newborn clothes. I think one of the most fun things about knowing how to sew and having a little girl is going to be all the cute outfits I get to make for her. So I of course needed to make her a little sweater, since I am learning to sew with sweater knits. It's also a kimono style shirt and I just love it! Until I made it I wasn’t too concerned about her “going home outfit”. I just figured we would take a few onesies with us to the birthing center and pick one that fits. However, once I finished this project I knew immediately that this will be hers. I love the idea of dressing her in something that I made for her as the first clothing she ever wears. Maybe it's just the pregnancy hormones, but thinking about it makes me a little verklempt. This little kimono is very easy to make and doesn’t take long. It was a great project as a second foray into sewing with sweater knits. I'm also becoming a big fan of sewing with cotton sweater knits. Especially if you are a beginner, they are very easy to sew with and don't take a whole lot of adjustments on your standard sewing machine. For this project I used the Natural White Cotton Jersey from the O! Jolly! Shop. I LOVE this fabric. It's so soft and cuddly, which makes it perfect for baby items. Because it's cotton, it will also be easy to wash and really nice weight for early Spring when Baby G. will be wearing it. For tools and settings on my machine, I used the auto tension setting, a Universal size 14 needle, a walking foot, a straight stitch for the bias binding and a zigzag stitch for the seams. If you want to make a larger size (instructions listed in the downloadable pattern) you will need more fabric, stabilizer and bias binding. To begin, download the Martha Stewart pattern and make the modifications shown below. 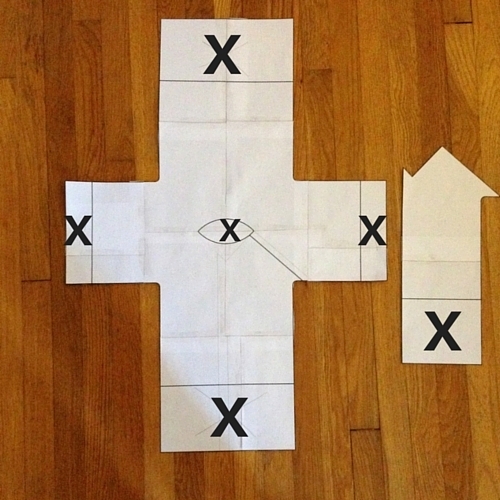 Print the pattern and put it together per the directions. I made the shorter option without cuffs, so I cut off the excess on the sleeves and front/back. I also modified the pattern pieces a bit because rather than hemming each piece, I added bias binding. To make this easier, I got rid of any corners and made them into smooth curves. I also modified the pattern pieces so that it was easier to sew the bias binding onto the fabric. 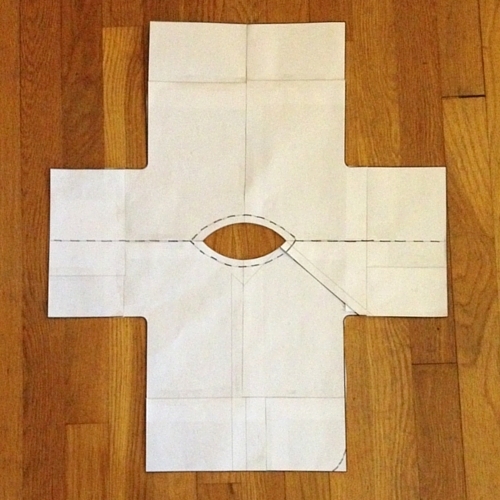 Place the pattern pieces on your fabric and cut out. Add stabilizer to all of the raw edges. Sew bias binding along the raw edges as shown on the patter pieces and the picture below. A straight stitch and all-purpose or walking foot will work for this step. Now, match piece A to piece C, right sides together, and sew along the top of the sleeve. Repeat this step with piece B and C, right sides together. 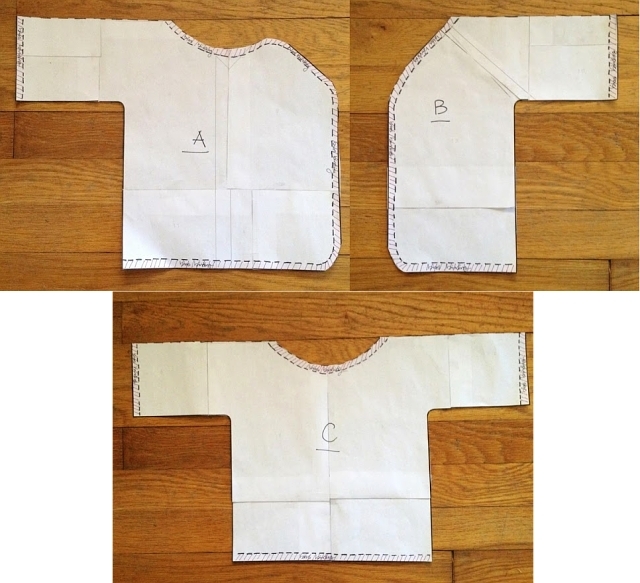 Sew both pieces at ⅜” seam allowance, with a zigzag stitch and a walking foot. Trim. Add bias binding to the edges of the sleeves. To finish sewing the garment, match the sleeves and sides of the sweater, right sides together and sew at a ⅜” seam allowance. Trim any raw edges and turn right side out. The final step is to add metal snaps for closure and decorative buttons. First, sew a piece a 3" piece of bias binding (sewn shut to make a string) or sturdy ribbon about 8.5" from the bottom of the garment on the inside panel (see picture below). Sew the piece on at an angle and add a snap to the end. Sew on the rest of the snaps. I eyeballed this step, marking where I wanted to place the snaps with a pencil to make sure they would match up. Finally, sew a few decorative buttons onto the front. 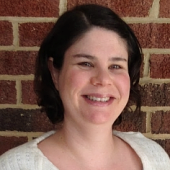 Maggie is a sewer and blogger living in North Carolina. She has known how to sew for as long as she can remember but admits to not being very good at it until just a few years ago. Maggie continues to learn something new every time she sits at her machine. Owner of UpSeam by Maggie, where she make handbags and wallets from upcycled fabrics and notions, Maggie also loves to share her knowledge and projects with others on her blog Miss Maggie Makes. Affiliate link in this article was inserted by the owner of this site.